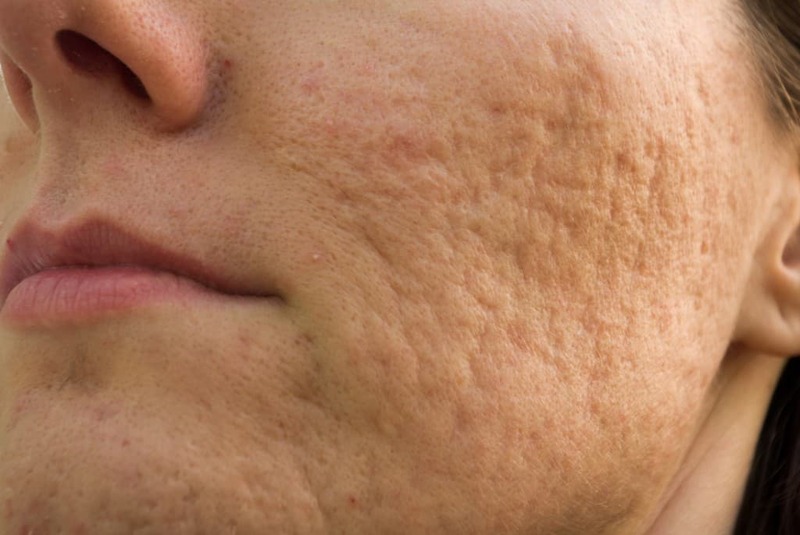 Acne scars can cause anxiety, depression, low self-esteem and other psychological problems. But now, advances in laser technology can effectively treat acne scars, regaining a persons self-confidence in the process. Acne scars are the result of deep skin infections, caused by acne pustules or cysts. When a spot forms, the follicle becomes blocked with dead skin cells, oil and bacteria. This causes the skin to become inflamed and to swell up as the internal pressure increases. When the internal pressure becomes too great, the follicle wall becomes ruptured, causing localised damage to the skin. If this rupture occurs near to the surface of the skin, the debris can drain away from the follicle and the skin heals fairly rapidly. But pustules which cause a break in the follicle wall deep inside the skin are much more problematic. The debris from the infection comes into contact with deeper levels of the skin, and damages healthy cells. When the skin is damaged, the body naturally reacts by producing more collagen. However, sometimes it produced too much collagen, which leaves a bumpy scar on the face, called hypertrophic or keloid scarring. It is also very common to see depressions left in the skin, which are known as atrophic scars. This occurs when there is a loss of tissue, leaving what are known as ‘ice pick’ scars and ‘boxcar scars’. This type of skin pitting is the most dramatic, and noticeable. All types of acne scarring can cause distress and increased self-consciousness. In some cases the scarring is so severe that individuals can lose confidence due to the appearance of their skin. But now, advances in laser technology are available to help people with this common problem. How does the acne scar laser treatment work? Andrea Catton boasts the two most advanced lasers in the world for treating acne scars and pores: PicoSure Focus Lens Array and the RevLite. 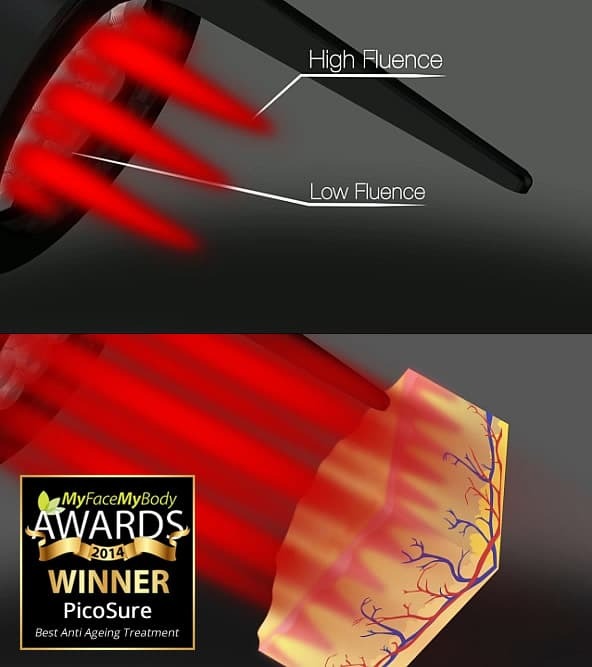 PicoSure FLA (Focus Lens Array) is a newly developed, cutting edge laser therapy, FDA approved to to treat acne scars. It works in a similar way as RevLite, in that it penetrates the skin to create areas of localised thermal damage. However, PicoSure technology combines a dual approach when treating skin conditions: a photothermal process and a photomechanical impact based on ultra-short pulse duration. This combination of photothermolysis and intense photomechanical impact, known as Pressure Wave™, breaks up the intended target while allowing the surrounding area to remain undamaged. With the addition of the FLA, each pulse is redistributed into microscopic patterns of ultra-high fluence tightly focused regions, embedded in a low fluence background (see image). It is this combined effect that restores normal skin elasticity in the scar tissue and thus reducing the appearance of the scar. RevLite laser treatment involves the application of a particular light wavelength, which is absorbed by areas of acne scarring. This light, known as PTP (PhotoAcoustic Technology Pulse), heats the skin, which has the effect of damaging the tissues just enough to provoke a healing response in the skin. The body’s natural reaction to damage is to repair itself, and it is this response that laser treatments provoke. 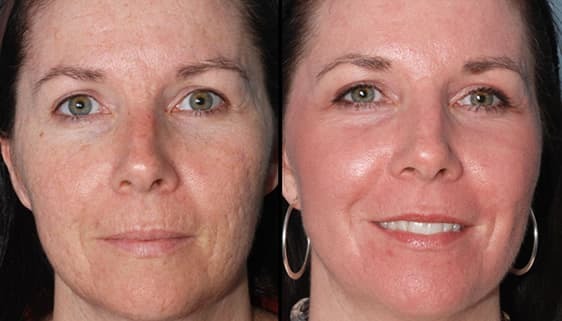 The laser penetrates the skin and targets the collagen and fibroplasts. The localised thermal damage causes an increase in the production of collagen in an acne depression, which in turn softens the edges and improves the appearance of the scars. The new collagen ‘plumps up’ the atrophic pits in the skin. Treatment with the RevLite laser will take between 20 and 40 minutes depending on the size of the are being treated and results will depend on the severity of your acne scars and pores. Treatment with the PicoSure FLA is much quicker and will take between 15 and 30 minutes. Every client is different, and it is only after an examination that we can assess what the final result will be. The very deepest scars are the hardest to treat but over time can be greatly reduced. In most cases, results can be seen within just 48 hours of your first session. You may require a number of weekly sessions, and our consultants will advise you on how many times you need to return to get the best results. However, if you opt for the PicoSure FLA then the number of visits will be greatly reduced, due to its cutting-edge technology. Many of our clients tend to opt for PicoSure FLA for several reasons including, quicker treatments, quicker recovery times, quicker results, and fewer treatments needed. 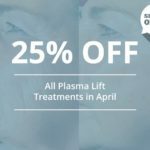 How much does laser acne scar treatment cost? 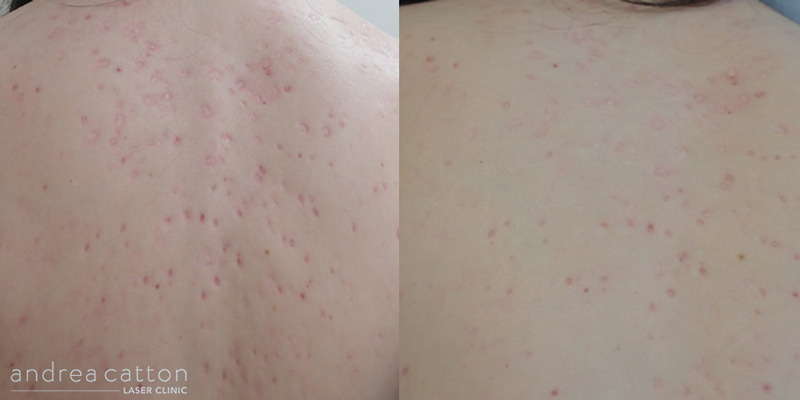 If you would like laser removal treatment for acne scars on areas of the body other than the face then you can send in a photo via our contact form here. 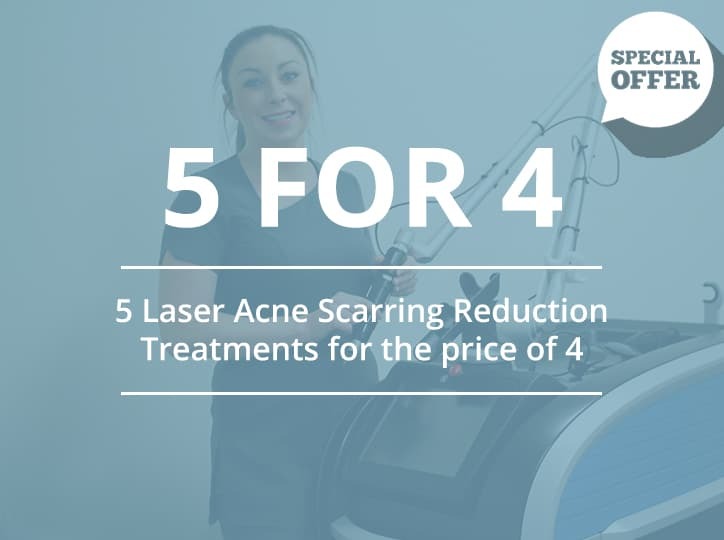 5 Laser Acne Scarring Reduction treatments for the price of 4. Consultations require a £50 deposit, which is deducted from any future treatments. 48 hours notice is required to move or cancel an appointment, or the deposit is forfeited at our discretion. What's the minimum age for treatment? The minimum age for acne scar laser treatment is 18 years. Duration varies depending on the laser used and the size of the area being treated. RevLite laser treatments take between between 20 and 40 minutes. PicoSure FLA treatments are quicker and take between 15 and 30 minutes. Are there any studies on PicoSure and acne scars? Yes. A study published in the Journal of the American Medical Association Dermatology found that PicoSure laser treatment produced significant improvements in the appearance and texture of facial acne scars at 3 months after the last treatment. Whatsmore, the average pain score was just 2.83 out of 10! 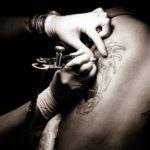 Does the treatment hurt? What does it feel like? For both the RevLite and the PicoSure FLA, most people describe the feeling as a tingling sensation but find the treatments tolerable. Many of our clients report that the PicoSure FLA is the most comfortable treatment. In a recent study patients scored pain levels at just 2.83 out of 10! How quickly will I recover? Will I need time off work? The beauty of our laser treatments is that there is virtually no downtime. 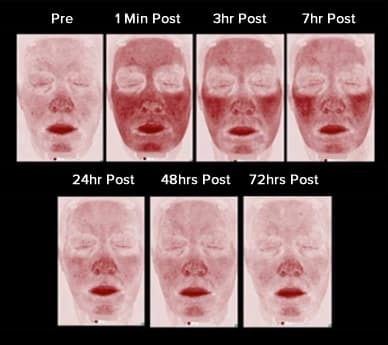 We say “virtually” because your treated skin will naturally be a little red but this starts to subside within 3 hours. Click here to view a photo of how quickly the redness subsides. Most of our clients don’t mind resuming their daily routine with a little redness as it just looks like they’ve been working hard at the gym! Anywhere between 1 and 10 as it depends on the individual and the laser used. The deeper the scars and the more of them, the more treatments required. If you’re after quicker results then we strongly recommend the FDA approved PicoSure FLA. One of our consultants will be to advise the number of treatments required during a consultation. Your skin will naturally turn a little red but this starts to subside within 3 hours. Click here to view a photo of how quickly the redness subsides. A minimum of 3 weeks with the RevLite and a minimum of 2 weeks with the PicoSure FLA.
We provide you with an aftercare leaflet on the day of your treatment. The main advice to note is to avoid sun exposure (including sun beds) for at least, 4 weeks prior to treatment and 4 weeks after treatment. If it’s not possible to avoid the sun then don’t stay exposed for long periods and always use a sunscreen of a minimum SPF30 on exposed areas. Avoid hot baths/showers, saunas, swimming pools, creams, body lotions, perfumes and restrictive clothing for 48 hours after your treatment.